In the last few weeks, a workfare proposal going under the general heading of “job guarantee” got picked up by Kirsten Gillibrand, Cory Booker, and Bernie Sanders. Advocates of the new workfare have done a lot to pitch the program as bold and unprecedented and this has ended up scrambling a lot of pundit and journalist responses because they have no referent for how to even begin to understand it. But the idea of conditioning receipt of welfare benefits (in this case unemployment allowance) on work is not remotely new. It goes back at least to the 19th century workhouses operated under the British poor laws. The term “workfare” was coined by civil rights leader Charles Evers in the 1960s. Indeed some of the newest crop of workfare advocates operating under the “job guarantee” label source their inspiration directly from these civil rights forerunners. Despite nods to this legacy, the advocates of the new workfare nonetheless distance from the term, most likely because the last time we did workfare in this country was on the heels of the 1996 welfare reform, which the left now regards as a cruel failure. 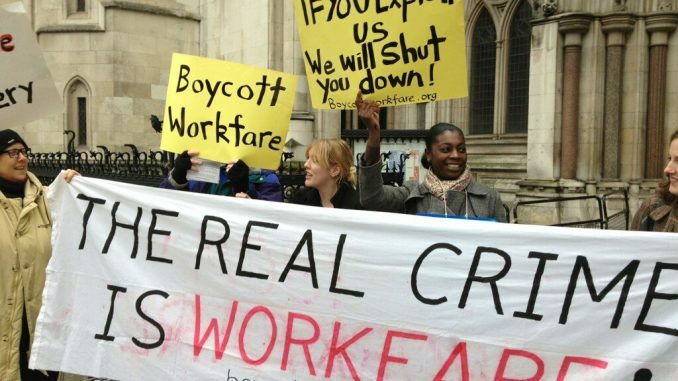 Distancing from the last bout of workfare we had makes sense as a political strategy, but if you want to start talking about what workfare actually looks like in practice, the prior models are an obvious place to start. In particular, the prior models help to answer the question that most advocates are very vague about: what kind of work can you realistically have the benefit recipients do? What kind of work checks off all the boxes of low-skill, temporary, able to go unfilled, low-capital, and non-competitive with existing jobs? Back in 1998, then-Mayor Rudolph W. Giuliani announced that every adult or head of household still on the rolls in the year 2000 would be working for a welfare check. He hired Jason Turner, then-Wisconsin Gov. Tommy Thompson’s welfare administrator, to accomplish this task for New York City. In an attempt to achieve the mayor’s goal, Turner created the largest workfare program in the country. All three are at play in the current workfare push as well. Advocates argue that the new workfare will cut other welfare payments such as SNAP, EITC, TANF, Medicaid, and CHIP. They argue that it will provide training and skills that can be used when benefit recipients move into real work. And then they argue that the work done in the workfare program is its own justification, that it gives people a chance to contribute. Meet the new workfare, same as the old workfare. The biggest rhetorical difference between the old workfare and the new workfare is that the latter justification — that the workfare job is a good in its own right — is getting more emphasis than the TANF workfare programs. But this emphasis then doubly raises the question of what are these jobs actually going to be like? What does actually fit all the constraints of workfare? Real workfare jobs are a far cry from the kinds of jobs many advocates seem to think could be done in the new workfare program. Despite claims to the contrary, you will not be building bridges out of a job guarantee office. You will not be doing child care out of a job guarantee office. You will not be staffing ambulances out of a job guarantee office. All of these tasks require either high levels of skill, large amounts of capital, or permanence of service, none of which meet the constraints that a workfare program has to deal with.